http://www.JewishWorldReview.com | In economics as in apparel, most fashions come and go. But like the navy blazer or the little black dress, bewailing the decline of American manufacturing never seems to go out of style. Foreman says these jobs are going boys and they ain't coming back. So sang Bruce Springsteen in "My Hometown," a hit song from his 1984 album, "Born in the U.S.A.". More than a quarter-century later, that sentiment (if not the song) is as popular as ever. "You know, we don't manufacture anything anymore in this country," says Donald Trump in an interview with CNNMoney. "We do health care; we do lots of different services. But . . . everything is made in China, for the most part." The Donald has his idiosyncracies, but on this issue, he is squarely in mainstream. A recent Heartland Monitor survey finds "clear anxiety about the decades-long employment shift away from manufacturing to service jobs," National Journal's Ron Brownstein reported in December. The "decline of US manufacturing" is giving Americans a "sense of economic precariousness" -- only one in five believe that the United States has the world's strongest economy, versus nearly half who think China is in the lead. "Near the root of the unease for many of those polled is the worry that the United States no longer makes enough stuff." When asked why US manufacturing jobs have declined, fully 58 percent cite offshoring by American companies to take advantage of lower labor costs. There's just one problem with all the gloom and doom about American manufacturing. It's wrong. Americans make more "stuff" than any other nation on earth, and by a wide margin. According to the UN's comprehensive database of international economic data, America's manufacturing output in 2009 (expressed in constant 2005 dollars) was $2.15 trillion. That surpassed China's output of $1.48 trillion by nearly 46 percent. China's industries may be booming, but the United States still accounted for 20 percent of the world's manufacturing output in 2009 -- only a hair below its 1990 share of 21 percent. "The decline, demise, and death of America's manufacturing sector has been greatly exaggerated," says economist Mark J. Perry, a visiting scholar at the American Enterprise Institute in Washington. "America still makes a ton of stuff, and we make more of it now than ever before in history." In fact, Americans manufactured more goods in 2009 than the Japanese, Germans, British, and Italians -- combined. The death of America's manufacturing sector? Not by a long shot. American manufacturing output hits a new high almost every year. 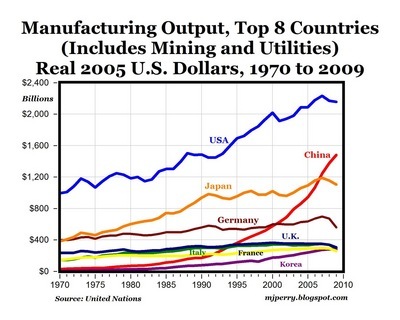 US industries are powerhouses of production: Measured in constant dollars, America's manufacturing output today is more than double what it was in the early 1970s. So why do so many Americans fear that the Chinese are eating our lunch? Part of the reason is that fewer Americans work in factories. Millions of industrial jobs have vanished in recent decades, and there is no getting around the hardship that has meant for many families. But factory employment has declined because factory productivity has so dramatically skyrocketed: Revolutions in technology enable an American worker today to produce far more than his counterpart did a generation ago. Consequently, even as America's manufacturing sector outproduces every other country on earth, millions of young Americans can aspire to become not factory hands or assembly workers, but doctors and lawyers, architects and engineers. Perceptions also feed the gloom and doom. In its story on Americans' economic anxiety, National Journal quotes a Florida teacher who says, "It seems like everything I pick up says 'Made in China' on it." To someone shopping for toys, shoes, or sporting equipment, it often can seem that way. But that's because Chinese factories tend to specialize in low-tech, labor-intensive goods -- items that typically don't require the more advanced and sophisticated manufacturing capabilities of modern American plants. A vast amount of "stuff" is still made in the USA, albeit not the inexpensive consumer goods that fill the shelves in Target or Walgreen's. American factories make fighter jets and air conditioners, automobiles and pharmaceuticals, industrial lathes and semiconductors. Not the sort of things on your weekly shopping list? Maybe not. But that doesn't change economic reality. They may have "clos[ed] down the textile mill across the railroad tracks." But America's manufacturing glory is far from a thing of the past.